We're happy to offer our DC readers the chance to attend a free advance screening of Father Figures, starring Owen Wilson, Ed Helms, Glenn Close, and JK Simmons. SYNOPSIS: Wilson and Helms are Kyle and Peter Reynolds, brothers whose eccentric mother raised them to believe their father had died when they were young. When they discover this to be a lie, they set out together to find their real father, and end up learning more about their mother than they probably ever wanted to know. The film also stars Oscar winner J.K. Simmons (“Whiplash”), comedian Katt Williams, NFL Hall of Fame quarterback-turned-actor Terry Bradshaw, Ving Rhames (the “Mission Impossible” films), Harry Shearer (“The Simpsons”), and Oscar nominee June Squibb (“Nebraska”), with Oscar winner Christopher Walken (“The Deer Hunter”), and Oscar nominee Glenn Close (“Albert Nobbs,” “Guardians of the Galaxy”) as the twins’ mother. The screening takes place on Wednesday, December 20th at 7:00pm at AMC Mazza Gallerie. If you'd like to attend, simply register at the Warner Bros. ticketing site here and download a ticket. Please remember that all screenings are first come first served and you'll need to arrive early to ensure receiving a seat. Enjoy the show! 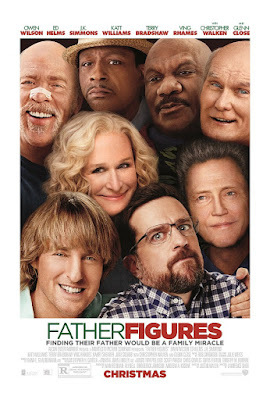 Father Figures opens December 22nd.